The dental team at The Perfect Smile Studios see over 25,000 patients each year and have performed over 4,100 smile makeovers. 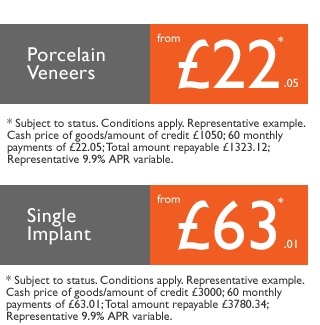 Your new smile costs less than you think with our amazing finance deals! 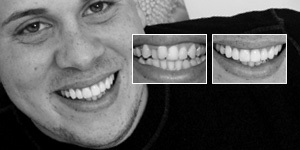 Our dentists have fitted more than 18,000 veneers. Perfect Smile Studios are proud to work in conjunction with the top veneer brands available in the UK right now. 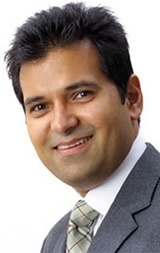 “Everyone was very helpful and talked me through all the options. 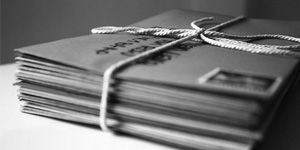 At no time did I feel under any pressure to undertake any treatment and, when I changed my mind at the last minute about what exactly I wanted done, they bent over backwards to do it” Patricia Morris, November 2017. To make it easier, we can even apply for you on the spot and get approval just seconds later. 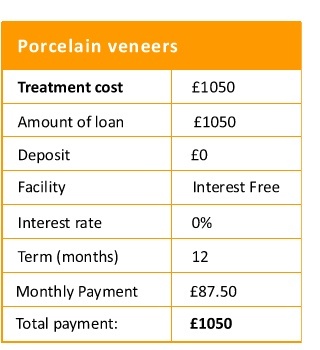 Porcelain veneers: cash price £1,050: 12 monthly payments of £87.50; total amount payable £1,050. This means cheaper monthly payments, helping making your dreams of a perfect smile and healthier teeth even easier! All credit is subject to status. Click on the calculator link at the bottom of the page for more details.